Pickle for 4 Hams 1/2 lb of Treacle sugar, 1/4 lb of salt petre not quite all to be used, 1/4 lb Bay salt, 1 oz salt prunella, 2 lbs of common salt. 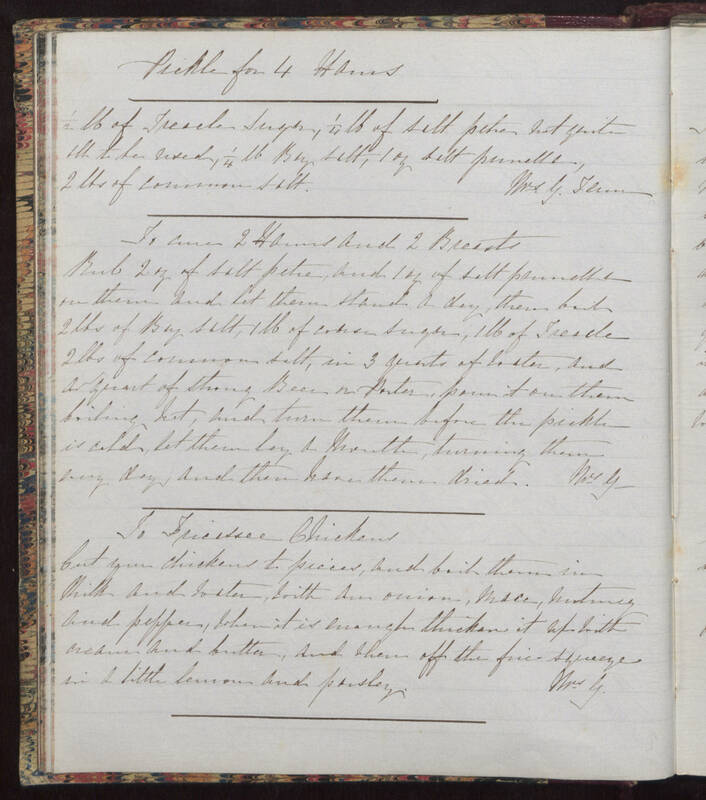 Mrs. G. Tenm To cure 2 Hams and 2 Breasts Rub 2 oz of salt petre, and 1 oz of salt prunella on them and let them stand a day, then boil 2 lbs of Bay salt, 1 lb of coarse sugar, 1 lb of Treacle 2 lbs of common salt, in 3 quarts of water, and a quart of strong Beer or Porter, pour it on them boiling hot, and turn them before the pickle is cold, let them lay a month, turning them every day, and then have them dried. Mrs. G To Fricassee Chickens Cut your chickens to pieces, and boil them in milk and water, with an onion, mace, nutmeg and pepper, when it is enough thicken it up with cream and butter, and when off the fire squeeze in a little lemon and parsley. Mrs. G.